Not all NMB members were happy with the employment of non-medical collaborators. 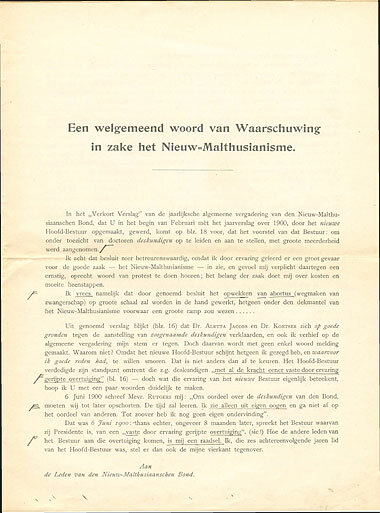 Board member E. Kempe, who was concerned about the reputation of neo-Malthusianism, explained his position in Een welgemeend woord van Waarschuwing in zake het Nieuw-Malthusianisme (A Sincere Word of Warning Concerning Neo-Malthusianism), which was sent to members of the NMB (1901). On the copy in the NMB-archive Mrs. Rutgers-Hoitsema wrote her angry comments: 'Smaadschrift van Kempe! '('Kempe's Libel! ').